Infrastructure matters. When your network or applications unexpectedly fail or crash, IT downtime can have a direct impact on your bottom line and ongoing business operations. In some extreme cases, data and monetary losses from unplanned outages can even cause a company to go out of business! The industry average cost of IT downtime is dependent on a lot of areas. The monetary losses vary when you consider your revenue, industry, the actual duration of the outage, the number of people impacted, the time of day, etc. For example, losses are significantly higher per hour for businesses who are based on high-level data transactions, like banks and online retail sales. If you experience an unplanned outage during peak traffic time, obviously the damage will be more significant. According to Gartner, the average cost of IT downtime is $5,600 per minute. Because there are so many differences in how businesses operate, downtime, at the low end, can be as much as $140,000 per hour, $300,000 per hour on average, and as much as $540,000 per hour at the higher end. 98% of organizations say a single hour of downtime costs over $100,000. 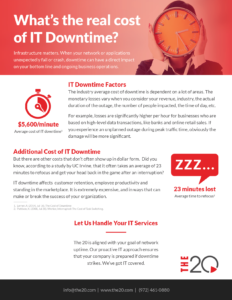 81% of respondents indicated that 60 minutes of downtime costs their business over $300,000. 33% of those enterprises reported that one hour of downtime costs their firms $1-5 million. But there are other costs that don’t often show up in dollar form. That’s the cost of interruptions, especially when IT professionals are interrupted from what might be more productive work. Take, for example, the interruption that occurs when someone pops into your office to tell you that your email server is down. That interruption, of course, takes the time it takes, plus the time to fix the problem. But did you know, according to a study by UC Irvine, that it often takes an average of 23 minutes to refocus and get your head back in the game after an interruption? As once reported in the Washington Post, interruptions consume, on average, 238 minutes per day. In addition, the time to get started back up after an interruption consumes another 84 minutes a day. The time lost to stress and fatigue steals another 50 minutes a day. All that adds up to about 6.2 hours per day, or 31 hours per week lost to interruptions! Is it any wonder we’re spending most of our time treading water? The truth is that no business is immune to the corrosive effects of downtime when it comes to customer — as well as employee — retention, productivity, and standing in the marketplace. Downtime is extremely expensive, and in ways that can make or break the success of your organization. At the same time, it’s essentially unavoidable, because technology architectures are becoming increasingly complex and unpredictable. The best news — and what really matters — is that simply taking a few steps to prepare for an outage can make a huge difference. You can, for instance, take the time to define which services require the most prioritized response, have contingency plans in place, leverage post-mortems to improve processes, and conduct regular testing. By taking the time to implement a plan for addressing inevitable downtime, your organization stands to realize thousands — or even millions — of dollars in quantifiable cost savings, as well as ensure the health of crucial qualitative factors such as employee morale, brand reputation, and customer loyalty. Download our IT Downtime infographic here.